After the marathon I’ve taken it easy and have been doing 3 mile recovery runs about 2-3 times a week in the mornings. The trip to Chicago on Friday was uneventful except my luggage was delayed. My first flight was on American and my second was on ATA (what?). I arrived in Chicago at 1:30 PM. My luggage didn’t make the transfer in Dallas. Luckily I had my running shoes, and timing chip with me – the important stuff. I took the CTA to downtown, found the hostel, got my assigned bunk, then went to the expo for my bib. At 6 PM I arrived back at the airport in time for the next ATA flight from Dallas, but still no luggage. Ugh! They said that the next flight was 11:30 PM, so they said that they’d drop it off from 12 midnight to 4 AM. 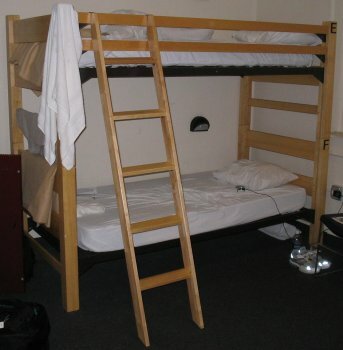 That night I had a carry-out spagetti dinner, watched TV in the hostel TV room, and relaxed by myself. On Saturday if my luggage was truly lost I was planning on going back to the expo and buying all the stuff I needed. This was all because I carried my running gel with me and for TSA security reasons I had to check my baggage but I could easily have gotten the gel at the expo and carried my baggage on – lesson learned. Well I woke at 8 AM and still no luggage, however they had found it. I went out running in my blue jeans, knit top and sweat shirt. Within a few minutes I bumped into Ed B. who was also running so we ran a few miles all over Millennium Park. When I got back at 11 AM my luggage had arrived and I could begin to relax. Saturday night I went to dinner with Kevin K., his wife, Pam, and parents, Pat and John at Bice. I was a “chatty cathy” and probably talked too much, but it was nice not being alone. Also it was the night before the marathon so I had soup and salad – trying to keep it light. Kevin and I arranged to meet before the marathon at 7 AM. 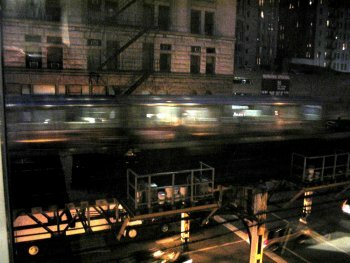 Have I mentioned that the El runs just outside my window and when it passes it sounds like a jet airplane going by, oh what fun. I knew this beforehand, so I didn’t expect to sleep much this weekend, but happily I did. Sunday morning was quite cool but not raining. I woke at 5:45 AM and dressed. Kevin and I met at 7 AM and joined the crowd at the starting line. I didn’t have breakfast so I had one of my running gels. At 8 AM the horn went off and it was about 10 minutes before we crossed the starting line mats. I got chills as we started and the crowds were screaming. Kevin and I stayed together throughout the miles. We were near the 4:30 group and were running at 10/M. Although Kevin had gone to the portapotties at the start I hadn’t and it was now weighing on me. So at about mile 5 we were running through a park and I told Kevin I had to go and there were some portapotties ahead. As I peeled off Kevin followed and the lines were too long so I headed for a tree. Unexpectedly Kevin followed too. So here I’m at this tiny tree peeing and my running partner is peeing next to me. Now that’s true running togetherness. The miles flew by with so many people around you. Unfortunately although we ran through the major neighborhoods of Chicago I don’t remember much of them. Nor do I remember the bands and cheering squads. At mile 13 I found Pam, Kevin’s wife, in the crowds and we stopped for a moment for Kevin to get new gloves then we headed off. I do remember entering Chinatown and the gate there, but by that time I was beginning to get stiff. Then at mile 23 I started going into myself totally forgetting about Kevin and just trying to survive. Slowly I drew away from Kevin. But shortly I got so stiff I had to stop and walk. As I was walking on the side I saw Kevin running by in the middle of the road. I told myself if he could do it so could I so I started running again trying to catch up to him. I got to within 8 feet and just couldn’t continue. So again I started to walk as I watched Kevin pull away. Only later did I find out that he didn’t know I was there and I felt so sorry that I didn’t tell him. In my heart I wished him the best as he receded into the distance. The 4:30 group passed by and I still couldn’t run. Finally I ran the last half mile and finished on 4:35:07. It wasn’t until that afternoon that I found out that Kevin also stopped to walk and finished in 4:32 all the while thinking I had finished before him. That afternoon Ed, Kate, his wife, Kevin and Pam had drinks at the hotel and went to an Irish Pub for dinner/dessert. 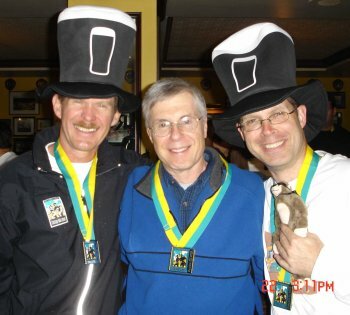 It was fun to relive the marathon, exchange stories and to laugh about it all. Ed B., me, and Kevin K.I was stiff Monday, but got to the Field Museum and saw the King Tut exhibit along with Sue, the T. Rex. Bidding Chicago goodbye I took the CTA to the airport. At the airport I snarfed down two large Ben and Jerry Cherry Garcia ice creams. The flight home was uneventful and it was nice to be home. It was quite an adventure. Here is my heart rate monitor. Update: I found this on my watch. Here are my mile splits and my heart rate. OK, here I go. I’ll be leaving on Friday morning. The Chicago Marathon is on Sunday, October 22 at 8 AM. My bib number is 4936. I plan on starting and completing it, but not much more. No finishing time is planned, but I think I’ll complete between 4:15 to 4:45 which is quite slow for me. I plan on running with Kevin and enjoying the day. Hopefully the weather will be OK. Remember that Chicago is known as the windy city. In any case, I’ll return on Monday. 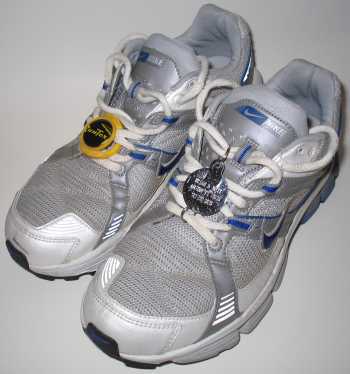 I’ve got my new shoes, my timing chip and my Petco ID tag. I’m ready to go. At 7 we ran 7 on the Town Lake trail. Chris, Bob, Ed, Kevin and I ran together. A few others ran too, but as soon as we started they were way ahead of us. We ran quite slowly. Chris and I chatted most of the time, and then he stopped to stretch at mile 6 and I finished with Kevin. At this time, I think Kevin and I might run the Chicago Marathon together. He’s hurt, and I’m hurt, so we’re a perfect pair – ha ha ha. Nothing fast, slow and steady – just getting it done. 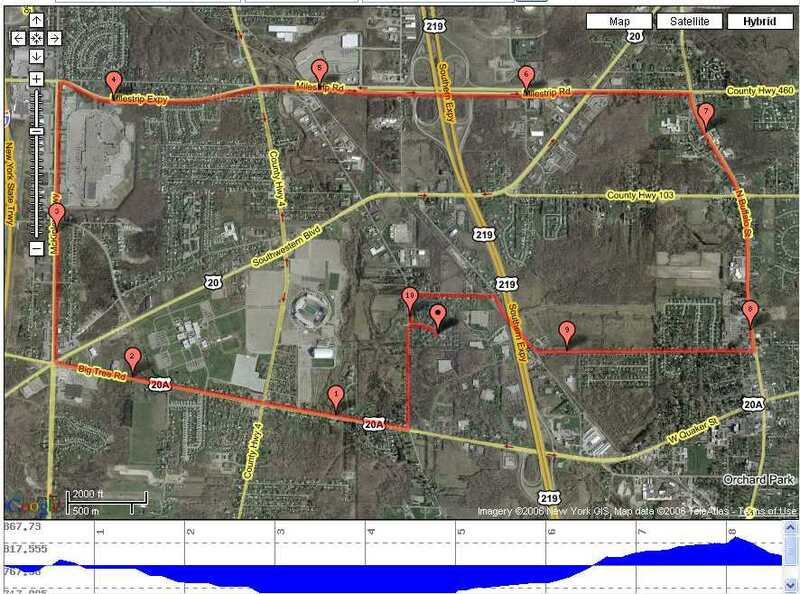 Last weekend I was in Buffalo visiting my father so I ran 10 miles long run in and around Orchard Park NY. It was sunny and cool. Very nice running weather. I had previously done this same route about a year ago so it wasn’t a new one. I bought a bottle of water at mile 3 and carried and drank it the rest of the way. I took it real easy and completed it in about 1:37 which is fine. My thigh muscle was tight and bothering me throughout, but I tried to ignore it. Afterwards it was trobbing like a headache. 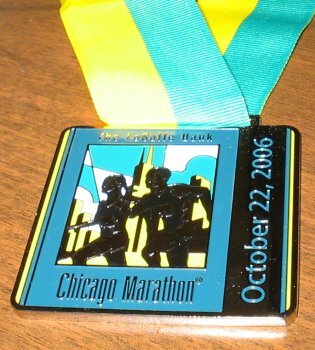 It didn’t make me feel good about what is physically happening to me so close to the Chicago marathon. My plan is now to just (1) start the race, and (2) complete it. I don’t even have a goal of running the whole thing, and I definitely am not concerned with my time – whoa no way. However, when I get done I’ll be disappointed because my time will be so bad. Oh well, I’ve got to accept my role in life as a has-been – at least for the moment. P.S. No heartrate monitor. Well we (Matthew and I) got up around 6 am today. We left the house at 6:45 AM, but traffic was a bit heavy going into the race so I finally got at the Rogue tent at 7:10. By that time the crowd had already left to do their two mile warm-up. So leaving Matthew at the tent, I followed them about 1/4 mile behind. It was hot and humid and by the time I was back I was all sweat. I introduced him to a few friends and we chatted waiting for the start. The race started at 8 AM and I left Matthew shortly afterwards. We had agreed that I would finish and then do my cool down back to him. I finished in 54:44 chip time (8:49/M). Then I returned to Matthew and he finished at 1:13:07 chip time (11:46/M). Afterwards we had water and a banana, and headed home satisfied considering the weather. I really tried to run smoothly. However, before the start my heart rate was higher than normal (around mid-90s). So my heart rate was high throughout which doesn’t bode well for Chicago marathon. Clearly my training this summer has been less than adequate for me and my fitness. Oh well. The graph clearly shows my race (up to first peak), then my cool down back to Matthew and his finish (second peak), then I forgot to turn off the monitor as we drove home (long finishing slope). One other thing, my left ankle and thigh were still acting up a little bit so I had to contend with them today too.